This is a resource for K-12 district and school leaders, teacher leaders, and their partners and advocates who wish to develop computer science education in their schools. With support from the National Science Foundation we created LeadCS.org as a starting point. It is a work in progress. In the future, we hope to refine and update existing tools and to create new resources. We continue to seek funding to further enrich and maintain LeadCS.org. We hope that you find the tools here to be of use; we welcome your comments on how you have used them and your input on how we can improve them. What do these computer science acronyms mean? This tool is a reference sheet that describes some of the most common acronyms used in computer science education. See the Computer Science Terminology tool for more in-depth explanations of specific computer science terminology. There are many acronyms used in K-12 computer science—and deciphering them can be challenging. How does this tool help? This quick reference sheet describes some of the most common acronyms used in computer science education, and provides links to more detailed lists in other places. See the Computer Science Terminology tool for more in-depth explanations of computer science terminology. Computer science education terminology can be confusing. This tool provides a list of frequently used terms in the computer science education field and summarizes their most common definitions. Educators, scientists, engineers, and others working in computer science related fields do not always define computer-related terms in the same way. Terminology confusion makes it difficult for K-12 educators and other leaders to clearly describe to others (district administrators, school leaders, other teachers, students, families, etc.) what computer science is and is not, and why it is necessary in the 21st Century. This tool provides a list of frequently used terms in the computer science education field and summarizes their most common definitions. It provides some context to the myriad of definitions and terms used in the computer science education field and can be used to drive discussions with stakeholders. This tool provides a clear definition of what computer science is (and is not) that a school leader can use when describing computer science in schools to teachers, parents, and others within and outside the school community. This tool identifies four common misconceptions that school leaders are likely to encounter when speaking with their stakeholders. It provides both short and long answers that principals can use to respond to and educate their communities. This tool connects K-12 leaders to a variety of strategies and resources for promoting computer science as a school course. An essential step toward bringing computer science to a school or district is demonstrating its importance to key stakeholders, such as parents, faculty members, community partners, and district leaders, and making recommendations for action. Your success will depend in part on winning and sustaining support from these groups. This tool connects school leaders with advocacy resources developed by the Computer Science Teachers Association (CSTA) and Code.org. CSTA is the professional association for computer science teachers. Code.org is a not-for-profit organization committed to expanding participation in computer science for all students. Both have developed templates, talking points, policy documents, and promotional materials to help advocate for computer science education. Why should students learn computer science? This tool summarizes the major arguments supporting the need for K-12 students to learn computer science. Many corporate, civic, and education leaders are giving K-12 computer science education a great deal of attention. Understanding the rationale and arguments about the need for computer science education will help school and district leaders craft successful policies and programs for their students, and enhance their ability to communicate with various stakeholder groups about their decisions. This tool outlines three common arguments in favor of including computer science as part of the K-12 curriculum. There are many resources with additional information listed in the references sections; leaders are also encouraged to visit the websites of advocacy organizations such as the Computer Science Teachers Association, Code.org, and the Association of Computing Machinery for additional insight. Argument 1: We need more computer science workers. One argument calls for an increased focus on computer science at the K-12 level because there are currently many computer science jobs open for those with the right skills, and the number of these jobs in the United States is expected to grow over time. There is considerable evidence that there is growing demand for STEM talent in the workforce. College graduates with STEM credentials have greater earning potential than those without STEM credentials (Carnevale, Smith, & Melton, 2011) and there is more demand for jobs in the STEM fields than others (Carnevale, Smith, & Strohl, 2013). The Bureau of Labor Statistics indicates that the fastest growing professional occupation category is “computer and mathematical science” and that the job openings for computer specialists projected for 2008-18 outranks all other categories (Wolf, 2011). Corporate recruiters continually indicate the need for STEM workers (Bayer Corporation, 2014) and computer science workers in particular (Microsoft Corporation, 2012). Among the STEM disciplines, information technology is “playing an increasingly important role in the work and personal lives of citizens” (Committee on Information Technology Literacy, 1999). Argument 2: The computer science field needs to be diversified. Another argument for expanding K-12 computer science education is based on a desire for equity and the merits of a more diverse workforce. Women and non-Asian minorities are underrepresented in computer science fields, as evidenced in the workforce and post-secondary and high school education. For example, many large technology companies have recently begun to report employee gender and race/ethnic identity statistics that demonstrate a severe lack of women and underrepresented minorities employed (e.g. Claburn, 2014). 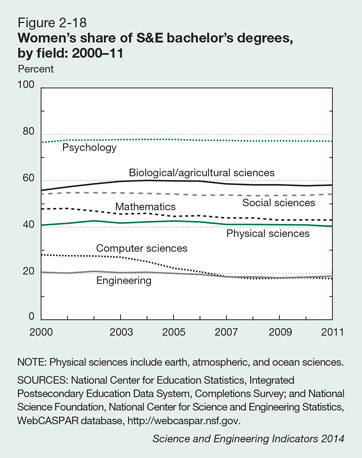 At the undergraduate level in 2011, women earned just under 20% of bachelor degrees in the computer sciences (National Science Board, 2014, see http://www.nsf.gov/statistics/seind14/content/chapter-2/fig02-18.png). At the high school level, only 19% of the 2013 Advanced Placement Computer Science A exam test takers were female (The College Board, 2013). Historically, underrepresented groups of students have had less access to computer science education than other groups (e.g., Margolis, Estrella, Goode, Holme, & Nao, 2010); expanding computer science education will help address that problem and fill the post-secondary pipeline with more and more diverse students. Argument 3: Computer science is fundamental to other activities. Others have made a similar case, such as Wing, calling computational thinking “a universally applicable attitude and skill set everyone, not just computer scientists, would be eager to learn and use” (Wing, 2006). Barr, D., Harrison, J., & Conery, L. (2011). Computational Thinking: A Digital Age Skill for Everyone. Learning & Leading with Technology , 20-23. Bayer Corporation. (2014). The Bayer Facts of Science Education XVI: US STEM Workforce Shortage—Myth or Reality? Fortune 1000 Talent Recruiters on the Debate. Journal of Science Education and Technology , 23, 617-623. Margolis, J., Estrella, R., Goode, J., Holme, J. J., & Nao, K. (2010). Stuck in the Shallow End: Education, Race, and Computing . Cambridge, MA: MIT Press. Wing, J. M. (2006). Computational Thinking. Communications Of the ACM , 49(3), 33-35. Wolf, M. (2011). BLS Projections for STEM Occupations . Paper presented at the PCAST Study On Higher Science, Technology, Engineering and Mathematics Education Planning Meeting, Washington, DC. How should I think about computer science in relation to other high school courses? What sort of connections with other disciplines and courses can or should be emphasized? This tool explores how computer science might be integrated or connected with other classes or disciplines. It discusses both the potential for integrating computer science content into other courses, as well as using computer science to fulfill graduation requirements in other subject areas. There are many potential connections that computer science can have with other high school content and courses. Some of these connections have the potential to accelerate and enhance computer science education efforts. However, not all of these connections are likely to be easy to implement, and many may have unintended consequences for students, teachers, and schools. This tool considers two areas of potential integration, overlap, and connection for computer science: (1) the content that is taught; and (2) the courses that are offered. School and district leaders are faced with questions about how best to connect computer science courses with other disciplines or departments. Generally, these questions fall into two related categories. Content. Where and how can computer science content best be integrated or connected with other disciplines? What connections or overlaps between the computer science teachers are teaching and the content and lessons in other classes might they consider? Courses. Should computer science be positioned as a separate academic department, or part of an existing mathematics, science, or other department? Should computer science classes satisfy graduation requirements in mathematics, science, or other subjects? What considerations should students, parents, counselors, and others take into account when looking at computer science courses within the mix of other high school requirements? The best answer to these questions is in most cases is “It depends.” It depends on the nature of the computer science content that is to be learned. It depends on the design and implementation of the computer science course, and of the course it could replace or supplant. It depends on the current structures and relationships among teachers and departments within the high school or district. It depends on the standards and goals in place for other disciplines. Some frameworks for STEM integration have been developed (for instance, National Academy of Engineering & National Research Council, 2014) but generally do not include computer science as a component. Some work has been done to connect computational thinking to the STEM disciplines, such as Sengupta et. al.’s work to connect computational thinking at the K-8 level (Sengupta, Kinnebrew, Basu, Biswas, & Clark, 2013) or Weintrop et. al’s discussion of computational thinking in science and mathematics courses (Weintrop et al., 2015). Many recommend positioning computer science in the high school context as a standalone course or course sequence not affiliated with, or positioned as part of another discipline. This is the “standalone case”: keeping computer science by itself and separate from other departments and curricular sequences. For instance, the Association of Computing Machinery (ACM) committee on K-12 curriculum recommends four half-year computer science courses (Tucker et al., 2004) and this model has been incorporated into the Computer Science Teachers Association (CSTA) K-12 computer science education standards (Seehorn et al., 2011). Major computer science education advocacy organizations believe that “computer science should be considered as its own subject within the K-12 system” (Hirotaka, 2014). There are advantages for leaders who take the standalone perspective: redesigning courses and lessons in other disciplines, changing teacher roles and altering multiple courses are all complicated and generally involve considerable expertise and support. Keeping the computer science work relatively separate from other school or district efforts enables a crisper focus and provides an easier pathway to get started since less curriculum and professional development is impacted. Computers are playing an increasing role in the study of mathematics (National Research Council, 2013). Content in the common core state standards for mathematics (CCSS-M) includes some limited aspects of computational thinking and computing practices (Council of Chief State School Officers & NGA Center for Best Practices, 2009), so mathematics can be another place to position computer science content and courses. For example, one of the standards for mathematical practice in the CCSS calls for students to be able to “reason abstractly” and “model with mathematics.” CSTA has developed an alignment matrix connecting the CSTA K-12 standards to the standards for mathematical practice, though the nature and substance of the alignment is not clearly described. However, most computer science courses currently are designed to “apply or fill gaps in students’ mathematical knowledge but include little new mathematics or emphasis on deepening understanding of students’ existing mathematical knowledge” (NCTM Emerging Issues Committee, 2015) so leaders are advised to exercise caution when equating content in these disciplines. Given that the CCSS-M practice standards are designed to work closely alongside the CCSS-M content standards and are quite inseparable from them (Illustrative Mathematics, 2014), merely adding computer science content to a mathematics course without careful thinking about content and sequencing will likely be problematic. Furthermore for most high school students, the new CCSS-M will require three years of high school mathematics courses (National Governors Assocation, Council of Chief State School Officers, & Achieve, 2008). “While acknowledging exceptions, it seems fair to say that even the highly regarded high school computer science courses mentioned above teach very little new mathematics. They may fill in gaps, such as teaching function composition, recursion, iteration, sets, and some other discrete mathematics, but most of the mathematical content in these courses has been encountered by students in middle school together with many of the of Algebra I topics, a few geometry topics, and statistics topics relative to the CCSS-M” (NCTM Emerging Issues Committee, 2015). There have been some attempts to connect broader ideas of “computational thinking” to K-12 mathematics curriculum (Weintrop et al., 2015), and some instructional materials exist such as Google’s Exploring Computational Thinking resources (Meyer, 2010) to move in this direction. Concerning content, computer science is not a subset of mathematics, and mathematics is not a subset of computer science. However, there are clear intersections between the disciplines, and depending on the content particulars, some integration might reap benefits for students and schools alike. Computer science courses should count as mathematics courses (i.e., called a mathematics course on a transcript) only if the mathematics content is primary focus of the course and computer science is used as a tool for learning the mathematics. Computer science courses can supplant a mathematics graduation requirement if it does not take the student off the track of reaching the threshold defined in the CCSS-M for college and career readiness; practically, that means that computer science courses can supplant a mathematics course requirement if the student has completed the equivalent of Algebra I, Advanced Algebra, and Geometry, generally as an option for the 4th year of mathematics. Computers and computation have played an important role in science for nearly 75 years (Metropolis, 1987) and that role will only increase in the future (for instance, Burdman, 2015). However, the overlap between science and computer science courses has been limited. The “science and engineering practices” in the Next Generation Science Standards (NGSS) (NGSS Lead States, 2013) include “using mathematics and computational thinking” (Practice 5) as one of the eight core practices of science and engineering that are “essential for all students to learn.” Despite this reference, this inclusion of computing is not as strong as the computer science community had hoped for during the NGSS development process (Computing In The Core, 2012; Massachussets Business Alliance For Education, 2013). Some connections have been shown between the NGSS practices, the NGSS disciplinary core idea “engineering, technology, and applications of science”, and content in the CSTA K-12 Computer Science standards (Lee, 2014). Still, this overlap between computer science content and practices and the NGSS is relatively small. All of the model course maps provided with the Next Generation Science Standards also include at least three high school courses in science (NGSS Lead States, 2013), which is more science coursework than many states require (Zinth, 2006). There have been some efforts to develop computer science-related units to embed in science courses that utilize computational thinking concepts (for instance, Horn, Brady, Hjorth, Wagh, & Wilensky, 2014) and efforts to use computer gaming concepts and structures to develop science instructional materials (such as Holbert & Wilensky, 2014). These efforts show potential for bringing computing to scale; these materials are designed to be added to existing STEM courses, requiring only additional tools and training and no additional class time for implementation (Wilensky, Brady, & Horn, 2014). However, they tend to only focus on computational thinking and not the broader range of content that makes up computer science. The new Next Generation Science Standards provide a forward thinking but challenging blueprint for schools and districts (National Research Council, 2014). While computer science is not emphasized in the NGSS, computation is well established as something that life, physical, and earth scientists do. This presents an opportunity for computer science educators as well as schools and districts. Particularly in districts using a replacement unit strategy (as described in, for instance, Cohen & Hill, 2000) to improve science instruction, selecting some units that incorporate both modern science pedagogy as well as computer science has potential to move things forward. Considering content, schools and districts are advised to follow principles similar to those of mathematics when considering treating computer science as science courses for graduation or transcript purposes. Computer science courses should count as science courses (i.e., called a science course on a transcript) only if the science content is primary focus of the course and computer science is used as a tool for learning the science. Computer science courses can supplant a science graduation requirement if it does not take the student off the track of reaching the threshold defined in state standards for college and career readiness. Some states, such as Florida (O'Conner, 2014), Kentucky (Wynn, 2014), New Mexico (Boyd, 2014), and Washington (Farivar, 2015), count computer science as a foreign language requirement (or are considering doing so). Some scholars have created verbiage (“logo-as-latin”) to describe the learning of computers in this fashion (Koschmann, 1997). “Spanish has a vocabulary of 10,000 words, with a consistent grammatical and sentence structure. In contrast, a typical computing language has a vocabulary of about 100 words, and the real work is learning how to put these words together to build a complex program” (Hirotaka, 2014). School and district leaders are advised to avoid connecting computer science education with foreign language content and classes. There are generally three types of classes that are categorized as vocational or career-and-technical education at the high school level. The first are family and consumer education classes, including “home economics.” The second are “general labor market preparation” courses, which address content not specific to any occupational area, such as such as typing, keyboarding, introductory technology education. The third are “occupational education” courses, which align to particular careers or jobs (Silverburg, Warner, Fong, & Goodwin, 2004). Enrollments in the first two categories have been declining across the nation for some time (Silverburg et al., 2004). The Federal Carl D. Perkins Career and Technical Education Act of 2006 drives all Career and Technical Education (CTE) in the United States. As part of this legislation, states are required to offer “‘career and technical programs of study’ that comprise academic, career, and technical content that prepares students to make successful transitions to postsecondary education and the workplace.” These programs must be in one of sixteen “career clusters,” which are “occupational categories with industry-validated knowledge and skills statements that define what students need to know and be able to do in order to realize success in a chosen field” (U. S. Department of Education, 2008). Two of these career clusters, Information Technology and STEM, are particularly relevant to K-12 education leaders seeking to advance computer science education—as the content in these areas is most connected to computer science (though some have argued that computer science applies to all career clusters) (Seehorn, 2010). Cohen, D. K., & Hill, H. C. (2000). Instructional Policy and Classroom Performance: The Mathematics Reform in California. Teachers College Record, 102 (2), 294–343. Horn, M. S., Brady, C., Hjorth, A., Wagh, A., & Wilensky, U. (2014). Frog Pond: A Code-First Learning Environment on Evolution and Natural Selection . Paper presented at the Interaction Design and Children 2014, Aarhus, Denmark. Koschmann, T. (1997). Logo-as-Latin Redux: Review Of The Children's Machine: Rethinking School in the Age of the Computer by Seymour Papert. The Journal Of The Learning Sciences, 6 (4), 409-415. Metropolis, N. (1987). The Beginning Of The Monte Carlo Method. Los Alamos Science . National Academy of Engineering, & National Research Council. (2014). STEM Integration in K-12 Education: Status, Prospects, and an Agenda for Research . Washington, DC: The National Academies Press. National Research Council. (2014). Guide to Implementing the Next Generation Science Standards . National Academy Press. Washington, DC. NGSS Lead States. (2013). Next Generation Science Standards: For States, By States . Washington, DC: National Academies Press. Silverburg, M., Warner, E., Fong, M., & Goodwin, D. (2004). National Assessment of Vocational Education: Final Report To Congress. This tool highlights resources at the website of the National Center for Women and Information Technology (NCWIT). NCWIT is a non-profit collaboration of many organizations working collectively to increase the participation of women in computing and technology. NCWIT publishes many resources for supporting leaders’ efforts to bring girls and women into computer science. According to NCWIT’s By the Numbers tool, by 2022 there will be 1.2 million job openings that are related to computing. In 2014, however, only 26% of the computing workforce was women. Of those women, only 3% were African-American, only 5% were Asian, and only 1% were Hispanic. Clearly, the field needs to engage more girls and women in computer science; expanding options and opportunities at the K-12 level can have a powerful impact. The underrepresentation of women in computer science is a widely recognized concern among computer science leaders. This tool highlights NCWIT’s resources targeting this issue and makes an introduction to this organization. This tool introduces you to the Alliance for Access to Computing Careers. Otherwise referred to as AccessComputing , this group, based at the University of Washington, is focused on increasing the participation of people with disabilities in computing fields. They provide advice, resources, mentoring opportunities, professional contacts, and funding for tutoring, internships, and computing conferences. AccessComputing is closely connected to University of Washington’s Disabilities, Opportunities, Internetworking, and Technology (DO-IT) Center. AccessComputing ’s position is: “When more citizens have access to computing opportunities, and when computing fields are enhanced by the perspectives of people with disabilities, we all benefit.” AccessComputing reports that the representation of students with disabilities in computing majors and degree completion decreases as education levels become higher. Ensuring K-12 computer science education programs are more inclusive of students with disabilities is an important goal for K-12 school and district leaders. This tool introduces school leaders to resources shared by AccessComputing and the DO-IT Center at the University of Washington. These resources include publications, videos, lessons learned, and what they refer to as “promising practices” focused on supporting people with disabilities in the computing fields. Contact AccessComputing for direct support at: accesscs10k@uw.edu or (509) 328-9331. Watch a video developed by AccessComputing . Go to the DO-IT Center, which includes resources to supplement those found at AccessComputing . Read the DO-IT Center’s teaching guidelines for using the Universal Design of Instruction (UDI). Review the DO-IT Center’s checklist for inclusive teaching and checklist for making computing departments and spaces welcoming and accessible to all students. This tool highlights resources at the website of the National Center for Women and Information Technology (NCWIT). NCWIT is a non-profit collaboration of many organizations working collectively to increase the participation of women in computing and technology. NCWIT has many resources that support educational leaders’ efforts to bring youth who are typically underrepresented in computer science into the field. According to Google, 91% of their overall US workforce identifies as White or Asian (PBS Newshour, 2014). Their tech workforce figures are similar, with employees who are White and Asian employees comprising 94% of that workforce. Similar disparities exist among other technology companies and at the undergraduate and graduate levels. For example, in 2013, African American and Hispanic students comprised only 3.8% and 6% of all CS bachelor’s degrees respectively (Zweben & Bizot, 2014, p.27; Monge et al., 2015). Other evidence of disparities resides at the K-12 level. For example, in 2013, 54.2% of AP Computer Science A exam takers were White and 28.3% were Asian/Asian American/Pacific Islander, with only 9.0% and 4.2% being Hispanic/Latino and Black/African American, respectively. Of all test takers, only 19% were female (College Board, 2015). Among other reasons behind these figures are a lack of opportunity and access to and opportunities within K-12 computer science in school. The underrepresentation of employees who identify as female and who identify as African-American and Hispanic (as well as with other ethnic/racial groups) is a concern shared by many computer science leaders. This tool directs school leaders to NCWIT and its advice for targeting this issue in the classroom. Go to: NCWIT’s Top 10 Ways to Engage Underrepresented Students in Computing, one resource in their larger collection of resources to help engage and retain students in computing. Monge, A. E., Fadjo, C. L., Quinn, B. A., & Barker, L. J. (2015). EngageCSEdu: Engaging and retaining CS1 and CS2 students. ACM Inroads, 6(1), 6-11. Zweben, S., Bizot, B. (2014) 2013 Taulbee Survey: Second Consecutive Year of Record Doctoral Degree Production; Continued Strong Undergraduate CS Enrollment. Washington, DC: Computer Research Association. This tool is designed to orient you to the issues you need to consider to ensure your technology infrastructure is sufficient to support your computer science education plan. Bandwidth is the size of the conduit, or “pipeline,” that data flows through to get from one area in a computer network to another. Bandwidth affects the data transfer rate, or the amount of data that can be carried across your network in a given time frame (usually a second). The higher the bandwidth, the more data can flow through the network in one second. Having enough bandwidth for your students and teachers to capitalize on the range of digital and online instructional resources is now considered just as important as other infrastructure requirements, like electricity and air conditioning. Bandwidth decisions should be a core part of every school’s and district’s overall instructional strategy for computer science (CS), made in collaboration with the district Information Technology department. If you are considering bringing computer science education to your school or district for the first time, you will need to assess your organization’s current bandwidth status and your anticipated network usage to determine if changes are needed. This tool does not provide details on bandwidth requirements for specific CS instructional resources. This is because the landscape of CS-specific instructional resources is rapidly changing at the same time as many other educational tools and activities that use the internet are expanding (e.g., e-textbooks, cloud computing, online assessments, distance education, multimedia, and web-based communication and collaboration) and bandwidth should be sufficient to support the simultaneous use of several of these applications. It is not recommended to adjust bandwidth piecemeal, adding a little bandwidth every time a new program or technology is adopted, because this strategy is both costly and untimely. Instead, this tool provides direction on how to make decisions about bandwidth that can support a range of activities now and into the future. There are a few common units of measurement used to talk about bandwidth. The most frequently used unit is “Megabits per second” (Mbps), where 1 Mbps carries 1 million bits of data per second. For smaller amounts of data, bandwidth may be described in “Kilobits per second” (Kbps), or 1000 bits of data per second. For larger amounts of data, bandwidth may be described in “Gigabits per second” (Gbps), or 1 billion bits of data per second. Internet users typically download, or retrieve data from the Internet, more than they upload, or transmit data and files to the Internet. Because of this, the data transfer rates for downloading and uploading activities are often reported separately. Bandwidth Capacity is the maximum speed at which data can be transmitted across a network. Available Bandwidth is the amount of capacity available during a given time frame. Sometimes bandwidth is reported per user, such as Bandwidth per Student or Bandwidth per Student/Staff. The terms bandwidth and broadband are often confused. While bandwidth refers the size of the pipeline that data flows through (which affects rate of data transfer), broadband is a general term to describe a “high speed” Internet connection (Department of Education, 2014). A range of telecommunications technologies allows data to travel via the Internet at high speeds, and therefore have broadband capability. There are two primary ways to obtain Broadband internet access: through wired and wireless technology. The two main wired technologies are cable internet (cable) provided via cable TV networks and fiber-optic cable (fiber) that uses light, rather than electricity, to transmit data. Wireless technologies include fixed wireless access, where the Internet is transmitted via platforms installed onto towers (WiMAX), mobile broadband access through cellular towers (4G or LTE), or satellite internet connection. The Department of Education’s 2014 publication, Future Ready Schools: Building Technology Infrastructure for Learning, provides a comprehensive discussion of the pros and cons of each type of technology. In general, data transmission via fiber is currently considered the fastest, and most reliable, way for school systems to increase their bandwidth, followed by cable (Department of Education, 2014). Most customers do not own fiber because the process of installation is cost prohibitive. Fiber use can be contracted through utility companies, telecoms, or railroads, or leased from internet service providers for shorter periods of time. Additional network equipment is necessary to “activate” or “light” the fiber. Compared to fiber, the cable infrastructure is more prevalent, so using cable might reduce initial installation costs. But, cable has a fixed capacity and more limited potential for expansion than fiber. In some rural or remote locations, where neither fiber nor cable is available, wireless internet may provide the best solution for broadband access. However, wireless connections are subject to more interference than wired. What is considered “high speed”? What is considered “high speed” changes as technology improves. Each year, the Federal Communication Commission (FCC) conducts a nationwide snapshot of residential consumer broadband performance across the United States. According to their 2014 report, Measuring Broadband America, the average broadband download rate during “peak usage periods” in 2013 ranged from 1 Mbps to 75 Mbps. This average rate is likely to increase in the future as internet providers continue to improve their offerings. Already, several providers have announced plans to offer broadband rates ranging from 100 Mbps to 1 Gbps. What is considered “high usage”? Some activities use more data than others in a given time frame. For example, five minutes of video streaming uses more data than five minutes of email and web browsing, and therefore requires more bandwidth. At the same time, increasing the number people doing the same activity at the same time (e.g., streaming a high-definition video) will also increase the amount of bandwidth needed. The Federal Communications Commission’s (FCC) Household Broadband Guide defines “high usage” as situations in which more than 4 users at a time are engaged in basic activities (like email, web browsing, or basic video streaming), while at the same time, more than one “high demand” activity is taking place (like HD video streaming, video conferencing, or online gaming). In this scenario, the FCC recommends having a bandwidth download speed greater than 15 Mbps per user. There is no single answer for how much “minimum bandwidth” is required to implement a CS program because bandwidth needs will vary across locations depending on the number of potential internet users in an organization (teachers and students), the number of devices used at any given time, and the type of resources that will be used by the teachers and students, which may be more or less data-intensive. When considering the bandwidth your school or district needs, it is important to take into account all the current and anticipated instructional and administrative activities that may take place online. These may include, but are not limited to: email, internet, e-books, video streaming, live video chat (e.g., Skype or Google Hangout), standardized assessments, computer programming tools, and distance learning. As published, the recommendations from these three sources are difficult to compare side by side because the minimum recommendations vary according to the proposed time frame, number of simultaneous users considered, and online activities supported. In addition, the recommendations are reported in different metrics (e.g., Mbps versus Kbps). Table 1 outlines the most current bandwidth recommendations from the three sources, organized according to time frame and activities supported. In general, future recommendations (2017-18) estimate more bandwidth needs than current recommendations (2014-15). The recommendations suggest more bandwidth is needed when a variety of online activities are used at once, while less bandwidth is needed to support standardized testing activities alone. Note that these recommendations are for connecting to the Internet through an external Internet Service Provider (ISP). Sometimes it might be appropriate to use your school or district’s internal wired or wireless network (i.e., within and between buildings in your organization) instead of an external internet connection. For example, the PARCC developers offer an option called “proctor caching” to administer the PARCC assessment using the internal school network. This option is for schools or districts with low connection speeds and/or large numbers of simultaneous users. They embraced their role as education leaders. They communicated regularly with all stakeholders from day one (including district curriculum directors, teacher leaders, department chairs, and students). They built a backward vision for technology needs based on instructional needs for curriculum, assessment, and evaluation. They considered not only obtaining the technology, but also the need for teacher training and professional development to use it. They engaged with the surrounding community to discuss technology needs and plans, which helped support funding for technology. Perhaps your school or district’s CS instructional program has been determined, and it is now time to estimate how much bandwidth it will take. While the bandwidth recommendations in Table 1 provide general guidelines, you may wish to calculate bandwidth needs based on district-specific numbers. The Bandwidth Estimator is an online calculator that you can use as a starting point. To use the calculator, input the total number of students and/or teachers on the network in your district (up to 1000), their estimated level of usage (low, medium, high), and whether or not users will access multiple devices, and then push the “calculate” button. The output provides estimated bandwidth needs in Mbps. The Technology Readiness Calculator is another online resource that you can use to estimate bandwidth needs. This calculator, developed by the Smarter Balanced Assessment Consortium in collaboration with the Partnership for Assessment of Readiness for College and Careers (PARCC) consortium, estimates the number of days and associated network bandwidth you would need to administer the Common Core English Language Arts and Mathematics assessments in your school or district. The calculation is based on number of students, computers, and hours per day computers are available for testing. According to a 2013 article published in Education Week, districts that have made improvements to their technological infrastructure to get ready for the Common Core assessments should be well equipped to use computer applications that require continuous network connectivity. To determine if and what changes need to be made to your school or district’s bandwidth infrastructure, it is important to assess the status of your current internet connection. You can use the School Speed Test to assess the bandwidth experienced by teachers and students in any school in real time. It requires no special plugins or software to run, but measured performance will be higher when using the most updated version of a web browser. You do not need to be in the school or physically connected to the school network in order to get an estimate, but you will need to indicate whether or not you are physically at the school or connected to the school network when running the test. To use the test, input the school zip code, city, and state, and then select the name of the school from a drop-down menu. The output provides both download speed and upload speed in Mbps. In addition to providing an estimate of current bandwidth, taking the School Speed Test is also an opportunity to contribute to a state and national database of internet speeds in classrooms nationwide. The nonprofit group, EducationSuperHighway, is leading an effort to build a national K-12 broadband inventory, based on School Speed Test data, to identify states, regions, and schools needing the most support for upgrades. While school speed tests are useful for determining the available bandwidth in a building, they don’t pinpoint which part of the network needs to be improved An Introduction to Bandwidth in School Systems: Terms, Recommendations, and Resources 8 to increase its speed. To do this, a network monitoring service can be requested from an internet service provider. Network monitoring gives the most comprehensive, accurate assessment of school bandwidth (Department of Education, 2014). For example, network monitoring can track network traffic and identify overloaded and/or crashed servers or other failing components. Although increasing high-speed broadband in school systems has been a federal priority since 2010, access to high speed internet continues to be a challenge for the majority of schools in the nation. In September 2014, the Consortium for School Networking (CoSN), a professional association for district technology leaders, surveyed over 1,000 K-12 district administrators and technology leaders from 47 states about the broadband and technology infrastructure in their districts. According to the CoSN E-rate and Infrastructure survey, only 9 percent of the districts reported that they have adequate bandwidth to fully meet the demand for online assessments and digital content over the next 18 months. According to the CoSN survey as well as a 2014 study conducted by EducationSuperHighway, a main barrier currently limiting schools’ broadband access is cost. Since 1996, the Federal Communications Commission (FCC) E-Rate Program (also called the “Schools and Libraries” program) has been the primary source of federal funding for bandwidth upgrades in K-12 organizations. Discounts, ranging from 20-90% of market costs, are based on the number of students eligible for the National School Lunch Program, with schools in low-income urban communities and rural areas receiving the highest discounts. However, every year since the program’s inception, demand has exceeded available funding, and costs for wireless (wifi) technology are not currently eligible for coverage. Efforts are underway to produce useful data on broadband pricing. In September, 2014, the FCC published the State School Connectivity Profiles, an overview of K-12 school and library connectivity in a geographically diverse sample of 13 states. The report details how these schools and libraries purchase internet access, including information on monthly price cost at different bandwidth levels. However, the data are not comparable across states because the featured states used a variety of different purchasing strategies. The Implementation Cost Comparison tool also provides a general reference for Internet pricing information. The tool, created by Project RED for classrooms transitioning to a “1:1” (1 device per child) learning environment, estimates hardware, software, and network-related costs (as of 2012) sideby-side for the “Traditional Classroom” (3:1 Ratio) and the 1:1 Classroom. The tool compares the costs of wireless network infrastructure and broadband connections (ranging from 10-50 Kbps/student). The authors note that pricing information for Internet access has substantially increased since the date of publication due to increased usage. In addition to bandwidth, the tool provides other potentially useful price referencing relevant to implementing computer science in schools, such as the estimated costs for technical support and teacher professional development. Recent studies have shown an emerging trend that the cost of connectivity in rural districts is considerably higher than in urban and suburban districts – a phenomenon known as the Rural Fiber Gap. Fiber-optic cable, regarded the technologically superior and most cost-effective option for increasing bandwidth, is not available in many rural areas. At the present time, the initial cost to install this cable is prohibitive for many districts without support. The E-rate modernization, slated to go into effect in 2015, looks to address this problem by helping school districts receive more affordable estimates for fiber installation. Bailey, J., Schneider, C & Vander Ark, T. (2012). Funding the shift to digital learning: Three strategies for funding sustainable high-access environments. Digital Learning Now. EducationSuperHighway (2014). Connecting America’s students: Opportunities for action. An analysis of E-rate spending offers key insights for expanding educational opportunity. Fox, C., Waters, J., Fletcher, G., & Levin, D. (2012). The broadband imperative: Recommendations to address K-12 education infrastructure needs. Washington, DC: State Educational Technology Directors Association (SETDA). Herold, B. (2014, January). Districts get creative to build faster internet connections: High-speed fiber-optic cable seen as key to quality access. Education Week, 33(17), 1, 12-13. Kent School District (district website). Page devoted to district Infrastructure and Systems. Kent, WA. The White House (2013). ConnectED: President Obama’s plan for connecting all schools to the digital age [fact sheet]. U.S. Department of Education Office of Educational Technology (2014). Future ready schools: Building technology infrastructure for learning. EducationSuperHighway is a non-profit organization focused on upgrading the Internet infrastructure in America’s K-12 public schools. Their 2014 National K-12 Bandwidth Pricing Report provides an analysis of over $450 million of the 2013-14 E-Rate spending. It identifies connectivity gaps for financially challenged districts and rural schools and provides practical guidelines for schools and districts looking for more affordable broadband solutions. A Fiber Toolkit which provides guidance on how to get started on upgrading your network, secure funding, purchase, and implement fiber connections for your schools. Resources for helping school districts complete their application for E-Rate funding (Form 471). Bailey, J., Schneider, C., & Vander Ark, T. (2012). Funding the shift to digital learning: three strategies for funding sustainable high-access environments. Digital Learning Now! . Retrieved from http://digitallearningnow.com/site/uploads/2012/08/DLN-Smart-Series-Paper-1-Final.pdf. Bocher, R. (2014). A summary of the major changes to the e-rate program from the July 11 report and order [PDF File]. American Library Association, 1-4. Retrieved from http://www.districtdispatch.org/wp-content/uploads/2014/07/summary_of_major_e-rate_changes.pdf. Education Superhighway (2014). Connecting America’s students: opportunities for action. An analysis of e-rate spending offers key insights for expanding educational opportunity [PDF File]. Retrieved from http://www.educationsuperhighway.org/wp-content/uploads/2014/11/Connecting-Americas-Students-K12-E-rate-Spending-Report-April-2014.pdf. Federal Communications Commission Office of Engineering and Technology and Consumer and Governmental Affairs Bureau (2014). Measuring broadband America- 2014: A report on consumer wireline broadband performance in the U.S. [PDF File]. Retrieved from http://www.fcc.gov/reports/measuring-broadband-america-2014. Fox, C., Waters, J., Fletcher, G., & Levin, D. (2012). The broadband imperative: recommendations to address K-12 education infrastructure needs [PDF File]. Washington, DC: State Educational Technology Directors Association (SETDA). Retrieved from http://www.setda.org/wp-content/uploads/2013/09/Broadband_Trifold.pdf. Partnership for Assessment of Readiness for College and Careers (2015). Technology guidelines for PARCC assessments: version Version 5.1 (October 2015) [PDF File]. Retrieved from http://www.parcconline.org/assessments/administration/technology. Smarter Balanced Assessment Consortium (2014). The smarter balanced technology strategy framework and testing device requirements [PDF File]. Retrieved from http://www.smarterbalanced.org/wordpress/wp-content/uploads/2011/12/Tech_Framework_Device_Requirements_11-1-13.pdf. The White House. ConnectED: President O’Bama’s plan for connecting all schools to the digital age [PDF File]. Retrieved from http://www.whitehouse.gov/sites/default/files/docs/connected_fact_sheet.pdf. U.S. Department of Education: Office of Educational Technology (2010). National Education Technology Plan 2010 [PDF File]. Retrieved from http://www.ed.gov/sites/default/files/netp2010.pdf. Wheeler, T. (2014). Remarks of FCC Chairman Tom Wheeler as prepared for delivery: Second Ed Tech Summit: empowering educators to enhance student learning in the digital era [PDF File]. Retrieved from https://apps.fcc.gov/edocs_public/attachmatch/DOC-334954A1.pdf. What instructional resources are available to teach K-12 computer science? A wide range of instructional resources are available to guide computer science instruction, including content frameworks, course materials, textbooks, software and programming languages/software tools, and lesson plans and activities. This tool describes some of the most visible computer science instructional resources, and provides a guide for school and district leaders considering instructional resources for computer science. Instructional resources include documents outlining content to be taught (frameworks), textbooks, lesson plans, unit plans, technological tools and other materials teachers use to identify, plan, and deliver their daily lessons. These resources guide and support teachers and thus can critically influence students’ learning opportunities. There is evidence that particular instructional resources used in the context of curriculum program interventions are associated with greater student achievement gains than “business as usual” (Whitehurst, 2009). Furthermore, science and mathematics instructional resources have been shown to influence the structure, content and strategies used during instruction (Weiss, Pasley, Smith, Banilower & Heck, 2003). Deciding which instructional resources to use is clearly an important decision. This instructional resource inventory describes a range of computer science education instructional resources for teachers, schools, and districts. It provides a starting point for leaders who want to bring computer science to their school or district, and are investigating the range of available options. This tool will help leaders more easily identify the right resources for their needs. This inventory has been designed to support your decision-making about which instructional resources are the best fit for your organization. This inventory is not comprehensive. Rather, it includes resources that are among the most visible, well-known, and widely used in K-12 settings, organized by categories that are relevant for schools and districts. Other useful instructional materials inventories exist (i.e. those provided by Code.org and the Computer Science Teachers Association). This particular inventory is organized to enable you to easily compare and contrast existing resources side-by-side and to provide a framework for categorizing other resources not included (e.g. those that have yet to be developed). The language that the field uses to discuss instructional resources can sometimes be confusing. The definitions of the terms used in this tool are below. A course is a unit of teaching that typically lasts one academic term (one or more semesters, one school year, or other designated time frame), is led by one or more instructors, and has a fixed roster of students. Some computer science courses are designed to be part of a course sequence in which students must complete one course before moving on to the next. In these cases, the course sequence developers identify a recommended order, or pathway that includes multiple courses. For example, Project Lead the Way (PLTW) offers a four-year computer science course sequence for high school students, beginning with one, half-year introductory course, and two, year-long “foundational courses,” followed by a variety of “specialization” courses. A content framework (sometimes called a “curriculum framework”) is a description of content to be taught in a course (i.e., the concepts, facts, processes, and procedures students are expected to learn). Content frameworks specify what must be taught, but do not specify which approach teachers should use to deliver the content. Therefore, one content framework may provide the foundation for multiple courses that teach the same content using a variety of different tools, strategies, or activities. The College Board has developed two content frameworks for the two AP computer science exams, AP Computer Science A and AP Computer Science Principles . See Table 1 for a description of these content frameworks. AP Computer Science A AP Computer Science A is equivalent to a first-semester, college-level course in computer science. The course introduces students to computer science with fundamental topics that include problem solving, design strategies and methodologies, organization of data (data structures), approaches to processing data (algorithms), analysis of potential solutions, and the ethical and social implications of computing. The course emphasizes both object-oriented and imperative problem solving and design using Java language. These techniques represent proven approaches for developing solutions that can scale up from small, simple problems to large, complex problems. The AP Computer Science A course curriculum is compatible with many CS1 courses in colleges and universities. AP Computer Science Principles (CSP) AP Computer Science Principles is a new computer science course designed to give students foundational computing skills, an understanding of the real-world impact of computing applications, and programming literacy. Leading computer scientists and educators, supported by the National Science Foundation (NSF), agreed that such a course was needed to increase the number of students interested in and prepared for success in computer science and other STEM fields. AP Computer Science Principles is designed to introduce a wider range of students to the central tenets of computer science. The course was developed and piloted in collaboration with leading high school and higher education computer science educators to reflect the latest scholarship in the field. Note: Several sets of course materials have been developed that correspond to these frameworks. Some examples of course materials aligned with the AP Computer Science Principles Curriculum Framework are in Table 2. Course materials are the instructional resources that are associated with particular courses. These may include lesson plans that are organized into topical units, syllabi, student activities (e.g. workbooks, labs, homework, videos, readings), lecture notes, and/or assessments (e.g., tests, quizzes). In some cases, course materials have been developed to correspond to particular content frameworks (e.g., several course materials exist for teaching content outlined in the AP CS Principles framework). Table 2 outlines course materials that have been developed for elementary, middle school, and high school computer science. Please note that all of the descriptions come directly from the course developers’ materials. K5 Code Studio X Code.org has developed an elementary school curriculum that allows even the youngest students to explore the limitless world of computing - at no cost for schools. The courses blend online, self-guided and self-paced tutorials with “unplugged” activities that require no computer at all. Each course consists of about 20 lessons that may be implemented as one unit or over the course of a semester. Even kindergarten-aged pre-readers can participate. Project Lead the Way Launch X Through PLTW Launch, our program for kindergarten through fifth grade, students become problem solvers. Students use structured approaches, like the engineering design process, and employ critical thinking. They apply STEM knowledge, skills, and habits of mind, learning that it is OK to take risks and make mistakes. As teachers and students learn and discover together, education becomes far more engaging. We designed PLTW Launch to offer maximum flexibility and work in a variety of settings and scenarios, which means we have an implementation model that will work for your school or organization. Middle Years Computer Science (MyCS) X X X Entitled Middle Years Computer Science, or "MyCS" for short, Harvey Mudd College’s online CS curriculum is designed for classrooms ranging from middle to early high school. Our goal: to provide engaging, accessible, and easy-to-use content to middle-years teachers, who can implement the content in their classroom using their own specific pedagogical adaptations of activities and exercises. DEPICT X X The DEPICT Curriculum has two major tracks to it - critical thinking activities and programming. First, it contains activities that develop critical thinking skills. These critical thinking skills are crucial to computer science, but they are also important for students in all areas of education. These critical thinking skills include breaking down large problems, analyzing the tradeoffs between solutions, and following and generating precise instructions. Second, it contains programming activities. These programming activities build computer science skills, and each module leads up to a single, somewhat more open-ended culminating project. Bootstrap X X Bootstrap is a curricular module for students ages 12-16, which teaches algebraic and geometric concepts through computer programming. At the end of the module, students have a completed workbook filled with word problems, notes and math challenges, as well as a videogame of their own design, which they can share with friends and family. CS in Algebra X Code.org has partnered with Bootstrap to develop a curriculum, which teaches algebraic and geometric concepts through computer programming. The twenty lessons focus on concepts like order of operations, the Cartesian plane, function composition and definition, and solving word problems - all within the context of video game design. By shifting classwork from abstract pencil-and-paper problems to a series of relevant programming problems, Code.org CS in Algebra demonstrates how algebra applies in the real world, using an exciting, hands-on approach to create something cool. Project GUTS X Project GUTS -- Growing Up Thinking Scientifically -- is a science, technology, engineering and math (STEM) program for middle school students based in Santa Fe, New Mexico and serving districts nationally. Growing up thinking scientifically means learning to look at the world and ask questions, develop answers to the questions through scientific inquiry, and design solutions to their problems. CS In Science X Code.org has partnered with the award-winning Project GUTS (Growing Up Thinking Scientifically) to deliver a middle school science program consisting of four instructional modules and professional development for the introduction of computer science concepts into science classrooms within the context of modeling and simulation. The goal of the program is to situate computer science practices and concepts within the context of life, physical, and earth sciences, and to prepare students to pursue formal, year-long courses in computer science during high school. Alice Instructional Materials X X An introduction to programming, using Alice 3 and Java. Students learn fundamentals of object oriented programming with a focus on developing high quality, working software that solves problems. There are links to the Alice 3 How To Guide, tutorial and course materials including lecture notes, and assignments. Exploring Computer Science (ECS) X Exploring Computer Science is a yearlong course consisting of 6 units, approximately 6 weeks each. The course was developed around a framework of both computer science content and computational practice. Assignments and instruction are contextualized to be socially relevant and meaningful for diverse students. Units utilize a variety of tools/platforms, and culminate with final projects. International Baccalaureate (IB) Computer Science – Standard Level (SL) and Higher Level (HL) X The IB DP computer science SL course requires an understanding of the fundamental concepts of computational thinking as well as knowledge of how computers and other digital devices operate. The course, underpinned by conceptual thinking, draws on a wide spectrum of knowledge and enables and empowers innovation, exploration and the acquisition of further knowledge. Students study how computer science interacts with and influences cultures, society and how individuals and societies behave, and the ethical issues involved. During the course the student will develop computational solutions. (AP CSP Course Materials) X In this course, you will create apps and other programs using the Snap programming language, you will learn some of the most powerful ideas of computer science, you will be creative, and you will discuss the social implications of computing, thinking deeply about how you can be personally active in promoting the benefits and reducing the possible harms. (AP CSP Course Materials) X Code.org’s CS Principles course is designed to be a full-year, rigorous, but entry level course for high school students. The curriculum is also written to support teachers new to the discipline with inquiry­based activities, videos, assessment support, and computing tools that have built-in tutorials and student pacing guides. (AP CSP Course Materials) X Mobile CS lesson plans are organized around the seven big ideas of the College Board’s emerging Advanced Placement (AP) CS Principles curriculum: Creativity, Abstraction, Data, Algorithms, Programming, Internet and Impact. More than 20 detailed tutorials cover programming topics in App Inventor. In addition, there are more than 30 lessons on computer science topics ranging from algorithms to binary numbers to computer security. Readings from Blown to Bits ask students to reflect on some of the big societal issues that characterize 2st century computing, such as privacy, security, social networking. (AP CSP Course Materials) X Computer science permeates our digital world and supports a variety of professions. This course exposes students to the big ideas in computer science that cross-disciplinary boundaries. Our inquiry-based, student-centered instruction engages diverse student populations with computer science content that is both rigorous and relevant to their lives. (Project Lead the Way) X Using Python® as a primary tool and incorporating multiple platforms and languages for computation, this course aims to develop computational thinking, generate excitement about career paths that utilize computing, and introduce professional tools that foster creativity and collaboration. This course can be a student's first course in computer science, although we encourage students without prior computing experience to start with Introduction to Computer Science. CSE helps students develop programming expertise and explore the workings of the Internet. Projects and problems include app development, visualization of data, cyber security, and simulation. This course aligns with the AP Computer Science Principles course. * This is a selection of some of the most visible courses that correspond to the AP CS Principles content framework. It is not a comprehensive list. A textbook is a book about a particular subject designed for the study of that subject. Many computer science courses have one or more associated textbooks that outline content that students are expected to learn. For example, the Project Lead the Way course, “Computer Science and Software Engineering,” has several required texts that students are expected to have regular access to. In addition, many high school computer science courses use Blown to Bits (Abelson, Ledeen & Lewis, 2008), a mass-market book about the internet and digital privacy. As in other disciplines, textbooks are used in a variety of ways in K-12 computer science coursework. While some courses may use a textbook as only a resource for student reading material, other courses rely heavily on the textbook to guide teacher instruction and student activities. Some textbooks are now sold as “packages” that, in addition to the text, provide supplemental instructional resources that can be accessed online. For example, the textbook Learning Java Through Alice 3 (Daly & Wrigley, 2014) has an associated website created by the authors that supplies lecture notes, tutorial videos, and samples of student work. Similarly, the textbook Java: How to Program (Early Objects), 10th Edition (Deitel & Deitel, 2015) comes with instructor resources available for download from the publisher’s website, including a lab manual, lecture notes, and a test bank. Table 3 provides a list of visible, well-known, and widely used textbooks for K-12 computer science education. Please note that all of the descriptions come directly from the course developers’ materials. (Daly and Wrigley, 2014). This book is designed for students wanting to learn fundamental programming concepts. No previous programming experience is required. All of the software used in this text are available to download. (Dann, Cooper, and Ericson; Pearson; 2010). This textbook is for introductory computing and programming courses at four-year and community colleges. Alice is used to introduce the fundamental concepts of programming, thereby decreasing early frustration with syntax errors usually encountered in a text editor. This textbook is listed by the College Board as a textbook that meets the curricular requirements of AP Computer Science A. (Dietel and Dietel, Prentice Hall, 2015). This textbook offers unparalleled breadth and depth of object-oriented programming concepts and intermediate-level topics for further study. Java How to Program (Early Objects), Tenth Edition, teaches programming by presenting the concepts in the context of full working programs and takes an early-objects approach. (Gaddis, Pearson, 2013). Starting Out with Alice: A Visual Introduction to Programming presents a fun and motivational way for novice programmers to learn the basic tenets of programming. Using Alice, an innovative and increasingly popular teaching tool, readers from a variety of backgrounds create virtual programming worlds of animations and computer games. (Guzdial and Ericson, Pearson, 2007). Using the video game generation’s fascination with digital multimedia as a springboard, this text teaches Java programming in a context that students find relevant and useful. Students learn to program using Java while creating interesting effects with sounds, pictures, web pages, and video. (Abelson, Ledeen & Lewis, 2008) This book is a trade book, often used in computer science courses. Written in plain English , the authors illuminate the myriad implications of the digital revolution, answering the questions you’ve wondered about‚ or ought to wonder about. Who owns all that data about you? What do they owe you? How private is your medical information? Is it possible to send a truly secure message? Who can you trust for accurate information when traditional media is replaced by thousands of unfiltered Internet sources? Please note that this is not an exhaustive list; such a list would be beyond the scope of this tool. Many additional instructional resources for K-12 computer science education (e.g., lesson plans, student activities, other resources) are not associated with specific courses. Rather, they are designed to help teachers incorporate computer science concepts into their existing instructional settings (e.g., grade levels, subject areas). Teachers decide which resources to use, alone or in combination, and how to integrate those resources into their instruction. Some resources are bundled together as sets of lesson plans organized into units, though the degree of organization and specificity is quite varied. For example, the Creative Computing Curriculum Guide to using the Scratch programming language encourages teachers to use as many or as few lessons as they like, in any order. Similarly, the Computer Science Unplugged collection of student learning activities can be used for lesson extension, enrichment, or as part of the core lesson in a variety of subject areas. Some resources are specifically designed for integration into an existing subject-area class. For example, Google For Education provides individual lessons on computational thinking that have been designed specifically for use in English language arts, mathematics, science, or history/social science classes. The Computer Science Teachers Association (CSTA) and the International Society for Technology in Education (ISTE) have also created a guide containing individual lesson plans that focus on computational thinking, customized for different subject areas and different grade levels. At times, instructional resources are simply presented as individual lesson plans on particular content topics. Generally, individual lesson plans contain the following, at minimum: (a) learning goals and objectives, (b) student activities, and (c) suggested strategies for the teacher to use to facilitate student engagement with content (e.g., whole-group instruction, questioning strategies). Sometimes lesson plans also contain materials checklists, background information about content for the teacher, links to educative resources, and recommended assessment strategies. Table 4 lists other lesson plans, activities, and resources to support K-12 computer science education. Please note that the resource descriptions came directly from the developers. Computational Thinking Resources from ISTE This collection of classroom and advocacy materials contains a Operational Definition of Computational Thinking for K–12 Education, a Computational Thinking Vocabulary and Progression Chart, a set of 9 Computational Thinking Learning Experiences, and a Computational Thinking Scenario that “illustrates how CT is implemented and assessed in the classroom. Creative Computing’s An Introductory Computing Curriculum Using Scratch This guide is a collection of ideas, strategies, and activities for an introductory creative computing experience using the Scratch programming language. The activities are designed to support familiarity and increasing fluency with computational creativity and computational thinking. In particular, the activities encourage exploration of key computational thinking concepts (sequence, loops, parallelism, events, conditionals, operators, data) and key computational thinking practices (experimenting and iterating, testing and debugging, reusing and remixing, abstracting and modularizing). CS Unplugged CS Unplugged is a collection of free learning activities that teach Computer Science through engaging games and puzzles that use cards, string, crayons and lots of running around. The activities introduce students to Computational Thinking through concepts such as binary numbers, algorithms and data compression, separated from the distractions and technical details of having to use computers. Importantly, no programming is required to engage with these ideas! CS Unplugged is suitable for people of all ages, from elementary school to seniors, and from many countries and backgrounds. Unplugged has been used around the world for over twenty years, in classrooms, science centers, homes, and even for holiday events in a park! Google For Education’s Exploring Computational Thinking Exploring Computational Thinking (ECT) is a curated collection of lesson plans, videos, and other resources on computational thinking (CT). This site was created to provide a better understanding of CT for educators and administrators, and to support those who want to integrate CT into their own classroom content, teaching practice, and learning. Computer science is relatively new to K-12 education. As a result, the number of computer science instructional resources that are commercially or freely available is somewhat limited compared to resources developed for teaching other content domains. Make instructional resource decisions carefully, so that the resources you select truly are the best fit for your students’ specific needs. Design a process to make your instructional resource decisions, so that you can make a systematic and well-informed decision. Ensure that feedback from all interested parties is considered and decisions about instructional materials are aligned with decisions about teaching assignments and budget allocations. Take the time to carefully review the materials, and seek out the opinions of other curriculum and computer science content specialists. Bring a critical eye to the pedagogical and instructional supports that computer science instructional resources provide, as they will be particularly important for teachers who may be new to teaching the content. Seek advice and input from authors, developers, and publishers of instructional resources, your local Computer Science Teachers Association (CSTA) chapter, and leaders in other schools and districts to answer your questions. As you review materials, consider your needs for specific instructional resource components such as formative and summative assessments, out-of-school work, and differentiation supports. Not all resources have all of these components so carefully consider their importance to meeting your students needs. Whitehurst, R. (2009). Don’t Forget Curriculum. Brookings Institution, Washington, DC. This tool makes an introduction to the Computer Science Teachers Association (CSTA), the professional organization for computer science teachers. CSTA provides support not only for teachers, but also for leaders at all levels. The Computer Science Teachers Association is a US-based international organization that supports the teaching of computer science at all levels. Its members include key advocates for computer science across the country and world. A local CSTA chapter can be a key partner for your success; CSTA headquarters produces all sorts of information to help K-12 education leaders advance computer science teaching, learning, and leading. This tool introduces school leaders to CSTA. CSTA connects and organizes computer science teachers all over the globe. Who in my community can help with my computer science education program? This tool provides an overview of steps and strategies school or district leaders can use to identify and locate potential community resources and supports (“asset mapping”) for a computer science education effort. Partnerships can be a key to growing and sustaining a computer science education effort. Asset mapping is an important part of the planning process that can help identify individuals, organizations and institutions that are present and that can help with specific needs. Establishing relationships with local individuals, organizations and institutions can be daunting. This tool explains the purpose and process of asset mapping, provides some worksheets for supporting your own asset mapping of computer science supports, and provides references to other asset mapping resources. An “asset” is “an item of value owned; a quality, condition, or entity that serves as an advantage, support, resource or source of strength” (Dorfman, 1998). Simply put, an asset is a place, organization, person, network or institution that can help you get where you want to be. “Mapping” is “to make a map of; to show or establish the features or details of, with clarity like that of a map; to make a survey of, or travel over for, as if for the purpose of making a map.” (Dorfman, 1998). In other words, mapping is a process of figuring out where things are. Asset mapping, then, is the act of identifying and locating people, things, services and resources in a community that can help further an interest or effort (Advancement Project, Healthy City Community Research Lab. 2012) – in this case, a computer science education initiative. Asset mapping can help you plan by emphasizing your assets (what you do have around you to build on) rather than focusing on deficits (what you don’t have). (Dorfman, 1998). For further information, see Dorfman, 1998 and Beaulieu, n.d.
Asset mapping might be considered the opposite of a needs assessment. Sometimes a needs assessment can unintentionally communicate a message that a plan has many shortcomings. (Beaulieu, n.d.). Asset mapping on the other hand, focuses on people who have power, ideas and capacities; and on existing talents and strengths and building relationships between them (Beaulieu, n.d.; Dorfman, 1998). Asset mapping has three important qualities. (adapted from Beaulieu, n.d.). It is relationship driven, meaning that the individuals who represent and are part of the assets work with one another. What Steps do I take to map my computer science education assets? When considering assets, it is important to identify more than material assets or sources of funding support in your community. These are certainly important, but so are other assets such as a person’s ability to make connections to others; knowledge about the merits of computer science; commitment to community growth; community organizations with content expertise; and messages from places of authority. Asset mapping not only identifies strengths that you as a leader can build on, but it can also identify focus areas around which you can rally support. By mapping community computer science related assets, you can identify ways that those assets can support your computer science effort. 1) Define your community boundaries. Make a concrete decision about what your community actually is. What are the precise boundaries of the community you are targeting for your asset mapping process? 2) Decide who to include in the asset mapping process. You may decide that at the outset that you prefer or need to go through the asset mapping process on your own. For some, however, having one or more other voices at the table can be extremely helpful. In addition to the obvious benefit that more people around the table will simply know more potential community assets, bringing other people to the table is an opportunity to bring potential partners on board. One option is to use a “participatory asset mapping process” that engages the potential “assets” themselves in asset mapping with you. (Advancement Project, Healthy City Community Research Lab. 2012). Once you have convened your group and defined your community boundaries, it is time to begin identifying your assets. Additionally, as you go through the identification process, keep the goal of your effort front and center. If a person or organization can further your goal, identify them as an asset. If not, then leave them out. Consider the following types of assets: individuals, organizations, institutions, and enterprises (see Tables 2, 3, and 4). Now that you have a list of assets to support your computer science efforts, the next step is to get more information about the people and organizations you don’t already know. This might include asking for meetings, visiting organizations, looking into their efforts that share your goals but may be operating independently of your efforts, and attending their events. While learning more about potential community assets, consider where each of those assets might fit with the different parts of your computer science education strategy. Consider how you can best use each asset to further your computer science education initiative. Asset mapping is never really complete; you will always be looking for individuals and organizations who can help. Still, doing a formal asset mapping exercise periodically can help you focus and identify where to start. Look at the information you have collected and decide which assets have the greatest potential for supporting your computer science education program at different levels of the program and at different levels of scale. Start there. Reach out to them to begin a dialogue. Beaulieu, Lionel. n. d. Mapping the Assets of Your Community: A Key Component for Building Local Capacity. Southern Rural Development Center. Wisconsin Department of Health Services. n. d. Asset Mapping. Retrieved from https://www.dhs.wisconsin.gov/library/asset-mapping.htm on August 25, 2015. What are the characteristics of a good school partnership? This tool provides seven principles to guide strong partnerships with businesses, universities, or other organizations. Partnerships can be an essential part of a K-12 computer science initiative’s strategy. Partnerships can contribute to the visibility of the effort; can help establish credibility in the community; can yield physical and human resources; and can help highlight the importance and benefit of computer science education. Principles for developing and maintaining a strong partnership are useful for guiding partnership efforts toward achieving specified goals. This tool outlines seven principles for staying on track with a strong, productive partnership. A partnership can be defined as a mutually supporting relationship between two entities that commit themselves to specific goals and activities intended to benefit schools and students. (Council for Corporate and School Partnerships, n.d.). Partnerships can encompass many different kinds of activities including curriculum development, professional development, incentives and awards, mentoring, and infrastructure development (Council for Corporate and School Partnerships, n.d.). This tool outlines seven recommendations for strong partnerships identified in a National Science Foundation funded study of the Ohio STEM Learning Network, a network designed to support the growth and development of STEM Schools. The OSLN is composed of several regional “hubs” that in turn are composed of participants from Universities, businesses and school districts as well as other organizations. The recommendations were derived from interviews with a sample of hub partners who worked together to bring STEM Education opportunities to students in their communities and spoke about their experiences working together. 1. Focus on a specific, concrete shared goal. Partnerships benefit from a focus on a clearly articulated goal that is rooted in shared values or a commitment to a common purpose. Although partnerships may be relatively simple (e.g. focus on a concrete exchange of goods or experiences), enduring and collaborative partnerships can benefit from a deeper connection. Although at times partnerships bring with them financial incentives, building the partnership on a shared goal may help to keep the partnership alive even in lean times. 2. Devote time to partnership development. Partnerships take work. They grow from conversations and collaborations that require identifying common interests, patient listening, and thoughtful co-planning. And, all of these activities take time. Make a commitment to providing yourself and others focused on building partnerships with adequate time to carry out the networking and communication activities that can lead to rich partnerships, as well as the specific activities of the partnership. themselves. 3. Prioritize resources for your partnerships. Partnership development and growth warrant the same prioritization as other parts of your initiative (e.g. professional development, establishing courses). Partnerships shouldn’t be optional “add-ons.” Rather, they should be part of strategy development and implementation and as such, part of at least one (and hopefully more than one) individual’s regular working responsibilities. If not identified as a specific job responsibility for one or more individuals, partnership development may languish under the pressures of other job responsibilities. 4. Partnerships thrive on trust and personal interaction. Partnerships may be organizational, but it is the individuals from each institution that drive the partnerships forward. These people need to “get to know one another” so that they can better know how to work together and develop the trust and understanding to withstand inevitable disagreements and complications. The more that partners know about one another and how they operate, the more likely they are to understand one another’s cultures and see the opportunities that can come from leveraging one another’s organizations. While online and phone communication are helpful, it’s likely to be very beneficial to have some face-to-face in person experiences, particularly in the beginning, to help establish trust and understand work styles. One-way communication (e.g., presentations) might open a door, but repeated, extended opportunities to interact and solve problems together will help build trusting strong working relationships. 5. Distribute roles and responsibilities. The responsibilities associated with creating, developing and nurturing partnerships should be distributed across several people in an organization. More specifically, it can help to have individuals at different levels of an organization involved in partnerships in both organizations so that inevitable disagreements have more than one avenue of resolution. Additionally, having more than one person involved addresses the very real threat of turnover. After partners have invested in developing a plan for shared work toward a common goal, that plan cannot depend on the presence and participation of a single individual. Although some partnerships do happen on an individual level, when creating and planning organizational partnerships, more than one person from each organization should be involved. Partnerships work best when there is a regular system for assessing the effectiveness of the relationship and planning for ongoing improvement. If they are to last, partnerships need to evolve as the context evolves, and that calls for ongoing assessment of what is and is not working. Regularly examine data on progress and explore alternative strategies when needed. This should happen at regular intervals depending on timing of data availability, but no less than two times a year. These points of assessing progress and considering strategy can also be opportunities to, when necessary, reaffirm the partners’ commitment. 7. Check your ego at the door. The Ohio STEM Learning Network Study (NSF- DRL #1008569) was conducted by Outlier Research & Evaluation at CEMSE | University of Chicago. How do I establish partnerships between my school and a business or university? Partnerships can be an essential part of a K-12 computer science initiative’s strategy. They can contribute to the visibility of the effort; can help establish credibility in the community; can yield physical and human resources; and can help highlight the importance and benefit of computer science education. This tool directs you to two resources that provide clear steps and associated worksheets to guide the process of creating partnerships for your school. For partnerships with businesses, look at “A How-to Guide for School-Business Partnerships” from the Council for Corporate & School Partnerships. This guide takes readers through a set of steps from “Getting Started” to “Laying the Foundation,” to “Translating Values into Action” and “Sustaining the Partnership” over time. This is a “how to” that provides educational leaders with a starting point for partnership development. Download the tool here. For partnerships with universities or researchers, look at the “Education R&D Partnership Tool.” This tool was prepared by Policy Studies Associates, Abt, EDC, and the University of Massachusetts as part of the Community for Advancing Discovery Research in Education (CADRE). It focuses on establishing collaborative projects and includes worksheets and other resources to guide the partnership development process. Download the tool here. When beginning a computer science initiative in a school, learning from others’ experiences can save time and resources. Nobody knows better how to support a school leader starting a program than school leaders who have already taken those initial steps. This tool captures some of that valuable advice. Enacting change in schools and classrooms is always a challenge. Learning from school leaders who have “been there” can help make introduction of a computer science education program easier. This tool includes advice directly from high school principals who know, first hand, about the practical and logistical steps needed to start and maintain a computer science program. This tool serves as a resource for education leaders to assess and describe student interest in computer science. When determining a computer science education strategy for your school or district, it is important to consider student interest in computing. This tool includes a questionnaire to assess student interest in computer science. A questionnaire allows leaders to systematically gather basic, descriptive data from students. Use the questionnaire as-is, or select the measures that may be the most informative about the students in your school or district. This tool is for K-5 principals who are introducing computer science to their school for the first time. Using the voices of elementary teachers, it identifies some of the barriers that principals might face that could affect their CS program implementation. Quotes are taken from K-5 teachers who were teaching a new CS program in the 2014-2015 school year. Unanticipated barriers are among the greatest challenges one can face when trying something new. Moreover, unless addressed, those barriers can prematurely end what might have otherwise been a successful initiative. This is the case for any effort that seeks to bring new practices to the classroom, including bringing computer science to elementary schools. This tool includes the words of real elementary teachers who have come upon some stumbling blocks in their efforts to bring computer science to their students. It can help raise awareness of potential problems that principals and teachers new to computer science can work together to address. These quotes are taken from K-5 teachers who were new to teaching computer science in the 2014-2015 school year. This tool highlights resources developed by the National Center for Women and Information Technology (NCWIT). NCWIT is a non-profit collaboration of many organizations working collectively to increase the participation of women in computing and technology. NCWIT publishes resources to help high school counselors discuss and promote computer science. Guidance counselors influence the educational pathways that students follow in and after high school. However, many guidance counselors are unaware of the college and career options for students that involve computer science, the necessary steps students should take to secure a computer science future, or the potential many students have for computer science related work. Providing them with tools or resources can help get them started. This tool connects to resources that NCWIT has developed specifically for guidance counselors. This tool is designed to orient you to some issues to consider when starting a computer science program in your school. How do I get a computer science program started in my school? Knowing where to start when implementing a computer science program can be daunting, especially when the content is new and unfamiliar. As states and districts evaluate where computer science fits in the existing K-12 structure, education leaders must plan for how they want to address computer science education in their schools. This tool includes five steps to starting a computer science education program and directs you to other tools that can help you accomplish each one. 1) Prepare: Educate yourself so that you can clearly and succinctly communicate your computer science education plan and what you hope to accomplish. This tool identifies four common misconceptions about computer science that school leaders are likely to encounter when speaking with stakeholders. It provides both short and long answers that principals can use to respond to and educate their communities. 2) Evaluate Your School’s Technical Capacity: Gather information about your school’s technology infrastructure to ensure it is sufficient to support your computer science education plan. This tool is designed to orient you to issues you need to consider to ensure your technology infrastructure is sufficient to support your computer science education plan. It provides direction on how to make decisions about bandwidth that can support a range of activities now and into the future. This tool includes the words of real elementary teachers who have come upon some stumbling blocks in their efforts to bring computer science to their students. It can help raise awareness of potential problems that principals and teachers new to computer science can work together to address. 3) Assess and Build Student and Community Interest: Look to your student population, your family population, and your community to learn about interest in computer science education and build community support. This tool is a resource for education leaders who wish to assess and describe student interest in computer science. This tool connects school leaders with advocacy resources developed by the Computer Science Teachers Association (CSTA) and Code.org. 4) Recruit Teachers to Join You: Identify one or more teachers to plan with you and help advocate for a computer science education program. This tool identifies starting points for finding applicants for high school computer science teaching positions. 5) Identify At Least One Committed Partner: Round out your computer science education planning group with one or more committed partners in the community. The partner might be a university, a business, a community group, or another community stakeholder. This tool provides seven principles to guide a school-business or school-university partnership. This tool is an orientation to the concept of “asset mapping” and provides an overview of steps and strategies you can use to identify potential supports for your computer science education effort. This tool highlights resources school leaders can use to introduce computer science to students with little or no prior experience with computing. Computer science has the potential to provide K-12 students with access to and opportunity to pursue a wide range of occupations and educational pursuits. Yet roughly 90% of the schools in the US do not offer computer science courses (Code.org, 2015). This tool links to programs and activities schools and districts can use to expand access to computer science education and introduce students to the subject area. Code Studio at Code.org is a collection of online computer science activities and courses freely available to students and teachers. CS Unplugged is a collection of activities teachers can do with students to introduce them to computing, without needing a computer. The Exploring Computer Science (ECS) curriculum includes introductory computer science lessons intended to spark student interest in computing. LeadCS.org (this toolbox) includes other resources leaders may consider using to engage students in computer science, such as online learning opportunities. NCWIT has resources specific to increasing student participation and retention in K-12 computer science. What is an easy way for me to do computer science in my school? What is the Hour of Code? Launching a school or district computer science education program takes resources, capacity, coordination, and time. The Hour Of Code provides place to begin with a structured and engaging activity to bring attention to computer science teaching and learning. Hour of Code is an initiative of Code.org, a non-profit committed to expanding participation in computer science. Well over 100 million people have already completed the Hour of Code. This tool takes you to the Hour of Code website. Go to: Hour of Code. What standards for K-12 computer science education exist? Which ones should we use, for which purposes? This tool summarizes a variety of standards related to K-12 computer science education and provides advice about how to use them in different contexts. It includes an in-depth overview of the CSTA’s K-12 Computer Science Standards and a discussion of related standards in other disciplines. The tool concludes with a series of recommendations for school and district leaders about standards adoption and use in computer science education efforts. Knowing how to introduce computer science into your school or district for the first time can be a challenge. An awareness of existing standards for computer science, including their utility and their limitations, can help leaders make better decisions about their goals related to computer science education. Standards, defined here as “statements that identify what students should know and be able to do over the course of instruction,” provide direction about what should be taught and assessed. In disciplines other than computer science, standards provide coherence and direction for improvement efforts. Compared to other disciplines, however, computer science is a relatively new field, and the state of K-12 computer science education standards reflect this newness. The new CSTA standards were released as interim standards in July 2016 and are going to be released as final standards by Summer 2017. One of the many inputs into the CSTA standards was the K–12 Computer Science Framework, a high-level guide for implementing computer science led by the Association for Computing Machinery, Code.org, Computer Science Teachers Association, Cyber Innovation Center, and National Math and Science Initiative in collaboration with states, districts, organizations and the computer science education community. The framework provides an overarching vision and holistic guidance for implementing computer science education by informing the development of standards, curriculum, and computer science pathways, and also helps school systems build capacity for teaching computer science. Standards are statements that describe the knowledge and skills (outcomes) students should possess at critical points in their educational career1. Standards generally do not describe or articulate a specific path to reaching those outcomes. So, while instructional materials or curricula may be designed to help students reach standards, they are not standards themselves. “Yet, despite this apparent unanimity about the intuitively appealing idea of standards, there is great confusion about its operational meaning: exactly what should the standards be, how should they be set and by whom, and how should they be applied to ensure rigorous and high-quality education for American students are the central questions that challenge policy makers and educators… Ambitious rhetoric has called for systemic reform and profound changes in curriculum and assessments to enable higher levels of learning. In reality, however, implementation of standards has frequently resulted in a much more familiar policy of test-based accountability, whereby test items often become crude proxies for the standards” (Shepard, Hannaway, & Baker, 2009, page 3). “Standards alone accomplish very little. But standards can help drive improvements when they inform all aspects of the educational system, including curriculum scope and sequence, curriculum resources, instruction, assessments, professional development for teachers and administrators, and state policies” (National Research Council, 2014). CSTA’s vision for computer science education in the 21st century. A description of the computer science content and skills that students should learn in grades K-12, organized by grade and content areas. Categorization of “levels,” or grade ranges for these CSTA learning standards and recommendations for what corresponding courses covering these standards might include. “Scaffolding charts” for each “level” and computer science “strand” in the CSTA standards that suggests the progression of these levels and strands over time. CSTA standards are a resource that many members of the computer science education community use. According to the CSTA, these standards “provide a framework within which state departments of education and school districts can revise their curricula to better educate young people in this important subject area and thus better prepare students for effective citizenship in the 21st century” (Computer Science Teachers Association Standards Taskforce, 2011, page 1). Many existing computer science instructional resources specify where they align with the CSTA standards. The CSTA standards document begins with the claim: “To function in society, every citizen in the 21st century must understand at least the principles of computer science.” They then describe a vision of computer science as part of every student’s education in nearly every year of school because one goal of the standards document is to increase the profile of computer science education at the K-12 level. The CSTA standards are organized into three grade band “levels”, corresponding to elementary (organized according to grades K-3, and 3-6), middle (6-9), and high school (9-12). They are further divided into five themes called “strands” that cross all three grade band levels: Computational Thinking, Collaboration, Computing Practice, Computers and Computation Devices, and Community, Global, and Ethical Impacts. The standards also include a “scaffolding chart” that suggests the progression of each of these strands across grade bands. The actual standards are written as a series of short declarative statements that describe the content and skills students should learn. For example, a grade 3-6 standard calls on students to be able to “gather and manipulate data using a variety of digital tools” (Computer Science Teachers Association Standards Taskforce, 2011, page 14) with no additional specific descriptions of the “manipulations” or “digital tools.” The standards include more details for some of the high school level learning outcomes (e.g. the specific debugging and testing methods that should be learned are listed), yet other statements (e.g., “select appropriate file formats for various types and uses of data” (Computer Science Teachers Association Standards Taskforce, 2011, page 19) remain more open to interpretation, making educational decisions difficult for education leaders new to computer science. The CSTA standards grew out of the earlier A Model Curriculum for K-12 Computer Science by the ACM/CSTA K-12 Task Force Curriculum Committee. This earlier work specified outcomes for grade levels, and these outcomes were organized by means of grade level “K-12 model curriculum” (ACM K-12 Task Force Curriculum Committee, 2006, page 6). In the newer, CSTA K-12 Computer Science Standards , learning outcomes are organized by grade band levels, but also model “courses,” which are presented as a very general description of the topics that could be covered in actual corresponding courses. These suggested “course” topics include “Computer Science and Me” (Level 1), “Computer Science and Community” (Level 2), and three types of courses for Level 3, including “Computer Science in the Modern World,” “Computer Science Concepts and Practices,” and “Topics in Computer Science” (CSTA Standards Task Force, 2011, page 8). A more detailed description of what CSTA proposes could be included in these courses can be found in A Model Curriculum for K-12 Computer Science . In contrast to the recent mathematics standards (Council of Chief State School Officers & NGA Center for Best Practices, 2009) and science standards (NGSS Lead States, 2013a) there is little information about how the CSTA standards were developed. A committee is listed, but the nature of the drafting or review process for these standards is unclear. The standards state “all drafts of this report have been informed by feedback from many organizations and individuals,” but the organizations and individuals are not described. Review of the committee names shows that most committee members were K-12 computer science teachers or university faculty, suggesting that it included relatively few members from other stakeholder groups such as non-computer science professional associations, school or district leaders, parent groups, or business representatives. While the research base used to design standards in mathematics and science is relatively established (e.g., Center On Education Policy, 2014; National Research Council, 2012), computer science as a discipline is relatively new. Therefore, the CSTA standards design is based on a much thinner research base. The standards include one page of citations, and many of them are for sources that describe issues facing the spread and scale up of K-12 computer science education in general rather than specifics about learning sequences or pathways that could be used to inform standards development. This section describes other sets of standards (and related tools) that may be useful for school leaders focused on computer science education. It includes the ISTE Standards, the Common Core State Standards for Mathematics, and the Next Generation Science Standards. The International Society for Technology in Education (ISTE) Standards for students (“ISTE Standards•S”) are “the standards for evaluating the skills and knowledge students need to learn effectively and live productively in an increasingly global and digital world.” As a product of a leading technology education professional association, the ISTE standards carry great weight with technology and computing teachers. They reflect the organization’s mission to “empower… connected learners in a connected world” and focus more broadly on technology in education rather than the specifics of computing or computer science. The ISTE standards are grouped into six categories: Creativity and Innovation, Communication and Collaboration, Research and Information Fluency, Critical Thinking, Problem Solving, and Decision Making, Digital Citizenship, and Technology Operations and Concepts. They focus less on what students should “know” and more on what they should “do”. Each of the six standards begins with a “Students use/demonstrate/apply…” statement followed by specific learning goals in support of the standard. For example, two of the learning goals in support of the standard “Creativity and Innovation” include “apply existing knowledge to generate new ideas, products or processes” and “identify trends and forecast possibilities.” ISTE standards have no grade-levels indicated though they indicate they are for “precollege” students. ISTE “Profiles for Technology (ICT) Literate Students,” are divided into four grade ranges (PK-2, 3-5, 6-8, and 9-12) and supplement the standard statements by providing “profiles” describing technology literate students and examples of “learning activities” that might be associated with a particular ISTE standard. For instance, the ISTE “Profile for Technology Literate Students, Grades 6-8” includes the following type of experience with technology and digital resources as an example of a “learning activity” in which students might engage during Grades 6-8: “Gather data, examine patterns, and apply information for decision making using digital tools and resources.” ISTE identifies this “experience” as closely linked to ISTE Standards 1 (Creativity and Innovation) and 4 (Critical Thinking, Problem Solving, and Decision Making). The Common Core is a set of high-quality academic standards in mathematics and English language arts/literacy (ELA). These learning goals outline what a student should know and be able to do at the end of each grade. The standards were created to ensure that all students graduate from high school with the skills and knowledge necessary to succeed in college, career, and life, regardless of where they live (Council of Chief State School Officers & NGA Center for Best Practices, 2009). There is some content overlap in the Common Core State Standards and the CSTA Computer Science Standards and ISTE Standards. Most overlap is found in the Common Core Standards section “standards for mathematical practice,” which “rest on important ‘processes and proficiencies’ with longstanding importance in mathematics education” (Council of Chief State School Officers & NGA Center for Best Practices, 2009). However, there is little if any computer science content in the Common Core, which has led to criticism from some computer science advocates (Johnson & Bookey, 2012). In an attempt to highlight content similarities in the CSTA Standards and the Common Core, CSTA has developed a series of documents that describe how the CSTA K-12 standards “correspond with other common national standards.” Connections identified by CSTA are presented in table form with various Common Core and CSTA standards arranged orthogonally. The Next Generation Science Standards (NGSS Lead States, 2013b) were developed by Achieve, Inc. in response to a framework developed by the Board on Science Education of the National Research Council (National Research Council, 2012). The CSTA is listed as a “critical stakeholder” of the NGSS, who “critiqued successive, confidential drafts of the [NGSS] standards and provided feedback to the writers and states, giving special attention to their areas of expertise.” Despite objections from the computer science education community (Massachussets Business Alliance For Education, 2013), the final version of the NGSS does not explicitly include computer science content. Computing can be found in the NGSS in the “core practice of science” section called “mathematical and computational thinking”. For more information, see the crosswalk between the CSTA standards and the middle school NGSS created by Code.org. The Partnership for 21st Century Skills is a collection of business leaders, educators, and policy makers organized to “position 21st century readiness at the center of US K-12 education and to kick-start a national conversation on the importance of 21st century skills for all students.” They have produced a framework that “describes the skills, knowledge and expertise students must master to succeed in work and life” that is “a blend of content knowledge, specific skills, expertise and literacies” (Partnership For 21st Century Skills, 2009). The Framework for 21st Century Learning includes student outcomes in four content areas: Core Subjects; Learning and Innovation Skills; Information, Media, and Technology Skills; and Life and Career Skills. Within the Media and Technology Skills section, the authors describe the need to access and evaluate information; use and manage information; analyze and create media products; and apply technology effectively. The Framework for 21st Century Learning focuses primarily at the level of general technology use, and not the more specialized use that computer science focuses on. Similar to the Common Core State Standards For Mathematics example above, the CSTA has produced a document that connects the Computer Science standards to the Partnership’s essential skills. Some computer science courses have particular course-level learning objectives or goals, such as AP Computer Science A, AP Computer Science Principles, and Exploring Computer Science (ECS). These are presented in “course framework documents” (as defined in the instructional materials tool) that provide a learning sequence, and describe what students should know and be able to do at the end of the course. This section provides general advice for school and district leaders working to address issues associated with computer science standards. A. Use the CSTA standards to set goals for your programs, but recognize the limitations. The CSTA K-12 Computer Science Education Standards are the best computer science standards currently available. They were developed by leading computer science organizations, and have widespread support within the computer science education community. Leaders can use them to set direction for computer science programs, as long as they consider their limited specificity and shallow research base. Popular computer science interventions (e.g. Exploring Computer Science (ECS), Code.org instructional materials, Project Lead the Way Computer Science program, etc.) already account for the CSTA standards, so the CSTA standards will not call for dramatic changes in places already implementing these programs. B. For now, prioritize course-level standards over district-wide standards. Adopting district-wide standards is not the only option for starting or accelerating computer science education improvement efforts. When leading change, small steps that build capacity and trust can also be effective. Carefully consider whether the success of your initiative will be compromised if you postpone adopting district-wide K-12 computer science standards and instead begin with a computer science course that has its own associated standards. More specifically, you could implement of one of the advanced placement CS courses (AP CS A or AP CSP) or an introductory computer science course using Exploring Computer Science (ECS) or Code.org materials. C. Evaluate standards alignment claims carefully. “Aligned to standards” is a complicated idea that educators, materials developers, and marketers often over-simplify. Alignment is a basic idea—agreement on both topic and cognitive demand (Porter, 2002)—that is challenging to execute. Despite considerable attention given to the common core standards in mathematics and publisher’s claims about textbooks being “aligned” to them, substantial alignment problems with many textbooks remain (Polikoff, 2014). Given the history of mathematics education and its robust research base, it seems likely that the much younger field of computer science education will face even greater alignment challenges. While CSTA provides some resources that align the CSTA K-12 standards with other standards, they do not specify how or why they determined the alignment. Other disciplines have more robust tools and processes for standards alignment (such as Blank, Porter, & Smithson, 2001) that the computer science education field should consider emulating. D. Advocate for developing revised, stronger standards for computer science. Given the limitations of the CSTA standards described above, they are not likely to be a sufficient support for successful and sustained computer science education efforts. A revision of the computer science education standards would be a major undertaking, but one that would be beneficial to both school and district leaders, as well as the computer science education community as computer science education efforts scale up across the US. ACM K-12 Task Force Curriculum Committee (2006). ￼ A Model Curriculum for K–12 Computer Science: Final Report of the ACM K–12 Task Force Curriculum Committee , October 2003. New York, NY: Association for Computing Machinery, Inc.
Blank, Rolf K., Porter, Andrew C., & Smithson, John. (2001). New Tools for Analyzing Teaching, Curriculum and Standards in Mathematics & Science (pp. 95): Council of Chief State School Officers. Computer Science Teachers Association Standards Taskforce (2011). K–12 Computer Science Standards . Washington, DC: Computer Science Teachers Association. Council of Chief State School Officers, & NGA Center for Best Practices. (2009). Common Core State Standards for Mathematics. Washington, DC. Johnson, Maggie, & Bookey, Jordan Lloyd. (2012). The Common Core Must Include Computer Science. The Huffington Post . National Research Council. (2012). A Framework For K-12 Science Education: Practices, Crosscutting Concepts, and Core Ideas. In Helen Quinn, Heidi A. Schweingruber, & Thomas Keller (Eds. ), (pp. 400). Washintgon, DC: National Academy Press. NGSS Lead States. (2013a). Next Generation Science Standards: For States, By States . Washington, DC: National Academies Press. No Child Left Behind Act of 2001, H. R. 1, United States Congress (2001). Partnership For 21st Century Skills. (2009). P21 Framework Definitions. Washington, DC: Partnership For 21st Century Skills. Polikoff, Morgan S. (2014). How Well Aligned Are Textbooks to the Common Core Standards in Mathematics? Paper presented at the Annual Conference of the Association for Education Finance and Policy, San Antonio, TX. Porter, Andrew C. (2002). Measuring The Content Of Instruction: Uses In Research and Practice. Educational Researcher , 31(7), 3-14. Public Law 103-227: Goals 2000: Educate America Act, (1994). Shepard, Lorrie, Hannaway, Jane, & Baker, Eva. (2009). Standards, Assessments, and Accountability Education Policy White Paper. Washington, DC: National Academy of Education. 1See http://www.library.illinois.edu/sshel/education/educstandards.html for details and further discussion. What tests are there for computer science? This tool provides an orientation to the status of K-12 student assessments for computer science. Assessments are an essential part of the teaching and learning process and serve a range of purposes: they can provide feedback to teachers to inform changes in instruction; they enable teachers and school leaders to make decisions about class organization and course placement; and they are tools for program assessment and improvement. Assessments may be specific to a set of instructional materials, measure more general concepts, or they may align with a particular framework or set of standards. They can be administered in many forms, including performance activities or tasks, student portfolios (collections of student work), multiple choice quizzes or exams, and essay responses. Decisions about the purpose and use of assessments are important to school and district leaders in all grades and subjects including computer science. This tool provides an overview of student assessments that currently exist for K-12 computer science education. The computer science education assessment landscape is quite barren, particularly compared to the very full landscapes of other subjects such as English Language Arts and mathematics. To fill that gap, computer science teachers have typically pieced together their own instructional resources and along with them, their own student assessments. As demands for computer science education increase, there will, undoubtedly, be an accompanying demand for quality assessments. Currently, however, there are few to draw from. This tool provides answers to basic questions about the status of tests in computer science education, provides descriptions of, and links to the few assessments that currently exist, and points to other resources and options school and district leaders could consider when designing and implementing a computer science education program. Before moving ahead, it is important to clarify two points. First, there is a difference between a psychometrically sound assessment and other assessments. A psychometrically sound assessment is one that has been carefully developed so that it demonstrates the widely accepted qualities of test reliability and validity. (A full discussion of reliability and validity is beyond the scope of this tool, but suffice to say that there are several types of reliability and validity that are established with different kinds of testing and analytic techniques.) This does not necessarily invalidate the merits of other assessments; but rather suggests that leaders should carefully consider the ways they use assessments, particularly those that haven’t demonstrated psychometrically sound properties. Second, assessments measure a range of outcomes. In this tool, we’ll refer to three different kinds of outcomes: (1) computer science disciplinary content; (2) computational thinking (sometimes considered part of disciplinary content); and (3) attitudes about computer science. Computer science disciplinary content includes facts and vocabulary, concepts, and practices. Computational thinking is, generally speaking, a problem solving process used by computer scientists (see the Computer Science Terminology Tool). There is currently no agreed upon set of computer science disciplinary content for K-12 education, although the CSTA’s K-12 Computer Science Standards (see the Content Standards in K-12 Computer Science Tool) offer one approach. And finally, attitudes refer to dispositions toward computing careers, the relevance of computing in the world, self-efficacy regarding computing, and affinity for computing. Are there any standardized tests for computer science K-12? Do computer science instructional resources have their own assessments? What is computational thinking and can I test that? What can I do to assess student outcomes right now? Question One: Are there any standardized tests for computer science content in K-12? There are currently no widely available assessments (psychometrically sound or otherwise) designed to measure computer science disciplinary content or computational thinking on a class, district or statewide level that are unaffiliated with specific courses. In other words, there are no standardized tests or other measures designed to be administered outside of the context of a specific course that can support school or district-wide record keeping, analysis or comparisons. Question Two: Do computer science instructional resources have their own assessments? As in other disciplines, some of the instructional resources currently available (or under development) have (or are developing) associated assessments. The Identifying Computer Science Instructional Resources tool identifies many textbooks and other instructional resources with some type of assessment— some in the form of problem sets or chapter questions (akin to those one might traditionally find at the end of a typical K-12 mathematics or science textbook chapter or unit) and others in the form of online puzzles or projects to complete. Some assessment options address factual or procedural content while others include more emphasis on conceptual knowledge. These can be helpful for identifying where students are succeeding or struggling with specific lesson content, for providing students with opportunities to practice or experiment with new skills and ideas, and for informing the grading process. Many of these measures, however, would not lend themselves to large student group comparisons or analyses because they have not demonstrated the appropriate associated validity and reliability qualities. One of the most recognized assessments for computer science is the College Board’s exam for AP Computer Science A (APCS A) For more about APCSA see the Instructional Resources tool. The exam is three hours long and consists of two sections that count for the same proportion: one section of 40 multiple-choice questions, and one section of 4 free response items. Upon completion, students receive an integer score from 1 to 5, with a score of 3 or higher generally indicating the student has met college-level standards. The College Board provides previous sample questions and scoring guidelines. The College Board reviews syllabi for AP courses each year to ensure alignment with the Computer Science A course framework and expectations. District and state-level reports are provided mid-summer that describe the number of students scoring at each of five levels. Districts and states can use this information to inform their computer science programs, but since the only students who typically take the exam are those enrolled in the AP course, the applicability of that data is limited. The College Board is also in the process of developing a second AP course intended to be an “adjunct” to APCS A called “Computer Science Principles” (AP CSP). This course differs from APCS A in that APCS A focuses on computing skills related to programming in Java. AP CSP, on the other hand, focuses on the “fundamentals of computing, including problem-solving, large-scale data, the internet, and cybersecrurity.” (College Board, 2015). For more information, see the Identifying Computer Science Instructional Resources tool. The AP CSP exam is currently under development and scheduled for its first use in the 2016-2017 academic year. It will include two “through-course” performance tasks for which students will upload digital artifacts and written explanations. The exam will also include a multiple-choice component, and like other advanced placement exams, it is designed to measure college-level performance in high school students. At least two of the resources in the Identifying Computer Science Instructional Resources tool have assessments developed with validity and reliability. The first is Project Lead the Way (PLTW). They have developed measures to accompany their instructional materials and attest to them meeting guidelines for reliability and validity. For schools that utilize the PLTW materials, those assessments may be options to gauge overall school or district progress. The second are assessments associated with Exploring Computer Science (ECS). SRI Education developed these assessments with funding from the National Science Foundation through the “Principled Assessment of Computational Thinking” (PACT) project. There is an assessment for each of the first four ECS units and a cumulative assessment covering those units. Teachers and researchers may download the assessments at https://cs10kcommunity.org/resource/ECSassessments. A free user account and membership in the ECS Open Group is required. Question Three: What is computational thinking and can I test it? Computational thinking, according to Wing (2006), is “…solving problems, designing systems, and understanding human behavior, by drawing on the concepts fundamental to computer science” (p. 33). Other definitions abound (Grover & Pea, 2013). For more information on computational thinking, see the Computer Science Terminology Tool. The multiple and somewhat complex descriptions of computational thinking bring with them a challenge for measurement. In order to measure any kind of learning, it is necessary to describe the outcome of interest with precise and measurable characteristics. The multi-faceted nature of computational thinking makes an already difficult measurement task even more challenging. And yet, like any concept or skill, without “attention to assessment, CT [computational thinking] can have little hope of making its way successfully into any K-12 curriculum” (Grover & Pea, 2013). And it is widely acknowledged that, “to judge the effectiveness of any curriculum incorporating CT [computational thinking], measures… need to be validated” (ibid.) . Still, there is no definitive tool for measuring computational thinking or even any measures that have been used across multiple projects. Efforts to assess computational thinking in students to date are primarily individual efforts. Some researchers have measured computational thinking by observing and rating tasks and projects (Denner & Werner, 2011; Franklin et al., 2013). Others have developed their own assessments to conduct their research (Gouws, Bradshaw, & Wentworth, 2013; Mingo, 2013). And still others have developed language specific mechanized computational thinking measures, like Dr. Scratch. Question Four: What can I do to assess student outcomes right now? The current relative lack of K-12 computer science assessments doesn’t relieve educators of the responsibility or need to assess student outcomes. Only very experienced computer science teachers who fully understand the content and appropriate ways to frame questions are in a position to develop their own tests. Given that many schools and districts don’t have such a person, they may use one or more of the following strategies. Assess outcomes we can measure. As educators follow efforts to develop measures of computer science content and computational thinking, they can also focus on other important student outcomes. For many, for example, improving student attitudes toward computing is a key goal. One student attitude survey is the Computing Attitudes Survey (CAS) by Tew, Dorn & Schneider (2012). This questionnaire explores problem-solving in computer science, as well as attitudes about discipline-specific topics like abstraction and scalability. Note that it was designed to detect pre-post changes in an introductory computing course for undergraduate students, but given the proximity in age to some high school students, the questionnaire may be relatively transferrable. Another possible outcome is student creativity. Since their creation in the 1960s, many researchers have used the Torrence Tests of Creative Thinking. Given that there are some emerging hypotheses that engaging in computing might be related to changes in student creativity, this might be an appropriate measure. Use Measures Currently Under Development. Research on computer science learning is growing and with it is the need for researchers to measure student outcomes. Some researchers are developing measures of computational thinking (as described above) while others are developing measures of computer science content (Buffum, et al., 2015; Tew & Guzdial, 2010; Seiter & Foreman, 2013; Brennan & Resnick, 2012). Other researchers are using interviews (Frankin et al., 2013), and still others use carefully developed rubrics. While these options are potentially usable, these assessments are relatively rarified and not developed for wide spread use. For those interested in measuring changes in student attitudes, the National Science Foundation funded BASICS project is currently developing a student attitude questionnaire for high school students. For more information about that work, go to the BASICS website. You can also learn more by looking at the Student Interest in Computer Science tool. Brennan, K., Resnick, M. (2012). Using artifact-based interviews to study the development of computational thinking in interactive media design. Paper presented at annual American Educational Research Association Meeting, Vancouver, BC Canada. Buffum, P., Lobene, E., Frankowsky, M., Boyer, K., Wiebe, E., Lester, J. (2015). SIGSE March 04-07 2015, Kansas City, MO, USA. A Practical Guide to Developing and Validating Computer Science Knowledge Assessments with Application to Middle School. Franklin, D., Conrad, P., Boe, B. Nilsen, K., Hill, C., Len, M., Dreschler, G., Aldana, G., Almeida-Tanaka, P., Kiefer, B., Laird, C., Lopez, F., Pham, C., Suarez, J., Waite, R. (2013). Assessment of Computer Science Learning in a Scratch-Based Outreach Program. SIGCSE’13, March 6–9, 2013, Denver, Colorado, USA. Copyright 2013 ACM 978-1-4503-1775-7/13/03. Gouws, L., Bradshaw, K., Wentworth, P. (2013). First year student performance in a test for computational thinking. South African Institute of Computer Scientists and Information Technologists (SAICSIT), October 8-9, East London, South Africa. Grover, S. and Pea, R. (2013). Computational Thinking in K-12: A Review of the State of the Field. Educational Researcher . 42:38. DOI: 10.3102/0013189X12463051. Mingo, Wendye, D. (2013). The effects of applying authentic learning strategies to develop computational thinking skills in computer literacy students. Wayne State University Dissertations. Paper 674..
Seiter, L. And Foreman, B. (2013). Modeling the Learning Progressions of Computational Thinking of Primary Grade Students. International Computing Education Research Workshop (ICER) August 12-14, 2013 San Diego, CA. Tew, A. and Guzdial, M. (2010). Developing a Validated Assessment of Fundamental CS1 Concepts. SIGCSE March 10-13, 2010. Milwaukee, WI. Tew, A., Dorn, B. Schneider, O. (2012). Toward a validated computing attitudes survey. ICER 2012. September 9-11, 2012 Aukckland, New Zealand. This tool identifies online computer science learning opportunities for high schools, focusing on options for schools where there are no existing computer science courses. School leaders who want to offer computer science courses often have a difficult time recruiting and hiring qualified teachers. Online options exist that enable schools to offer computer science courses as a first step toward developing a robust computer science program with properly credentialed teachers. This tool describes the landscape of online computer science learning opportunities, and provides some guidance for school and district leaders about choosing from the online computer science learning options. This tool highlights options that school leaders can explore when computer science teachers aren’t readily available in their schools. Great teachers are essential for a successful computer science program. However, teachers already prepared to teach computer science can be difficult to find (Wilson et al., 2010) and retain (Bernier and Margolis, 2014). In the United States, there is a lot of momentum behind increasing K-12 computer science learning opportunities for students (Wilson, 2010). However, trained K-12 computer science teachers are limited, as are coordinated professional development options for them (Century et al., 2013) This tool describes several options leaders can consider to “jump-start” a computer science education program when they don’t already have computer science teachers on staff. Finding good teachers is always a challenge, and for computer science in particular, the challenge is especially acute. Nonetheless, if school leaders are going to bring computer science to their students, they need to find teachers. This tool identifies four ways to seek out high school computer science teachers. This tool provides an overview of teacher credentialing requirements and pro-cesses in the United States. The shortage of qualified K-12 computer science teachers is well documented (U.S. Department of Education, 2014; Ni & Guzdial, 2012; Goode, 2007). Some states have initiated procedures to offer computer science credentials to new and in-service high school teachers. This tool summarizes the state of high school credentialing across the United States. It includes information about teacher endorsement and licensure op-tions for K-12 computer science teachers for each state.